Increases in the spatial scale and intensity of activities that produce marine anthropogenic sound highlight the importance of understanding the impacts and effects of sound on threatened species such as marine turtles. Marine turtles detect and behaviorally respond to low-frequency sounds, however few studies have directly examined their behavioral responses to specific types or intensities of anthropogenic or natural sounds. Recent advances in the development of bio-logging tools, which combine acoustic and fine-scale movement measurements, have allowed for evaluations of animal responses to sound. Here, we describe these tools and present a case study demonstrating the potential application of a newly developed technology (ROTAG, Loggerhead Instruments, Inc.) to examine behavioral responses of freely swimming marine turtles to sound. The ROTAG incorporates a three-axis accelerometer, gyroscope, and magnetometer to record the turtle's pitch, roll, and heading; a pressure sensor to record turtle depth; a hydrophone to record the turtle's received underwater acoustic sound field; a temperature gauge; and two VHF radio telemetry transmitters and antennas for tag and turtle tracking. Tags can be programmed to automatically release via a timed corrodible link several hours or days after deployment. We describe an example of the data collected with these tags and present a case study of a successful ROTAG deployment on a juvenile green turtle (Chelonia mydas) in the Paranaguá Estuary Complex, Brazil. The tag was deployed for 221 min, during which several vessels passed closely (<2 km) by the turtle. The concurrent movement and acoustic data collected by the ROTAG were examined during these times to determine if the turtle responded to these anthropogenic sound sources. While fine-scale behavioral responses were not apparent (second-by-second), the turtle did appear to perform dives during which it remained still on or near the sea floor during several of the vessel passes. This case study provides proof of concept that ROTAGs can successfully be applied to free-ranging marine turtles to examine their behavioral response to sound. Finally, we discuss the broad applications that these tools have to study the fine-scale behaviors of marine turtles and highlight their use to aid in marine turtle conservation and management. Increases in the spatial scale and intensity of activities that produce anthropogenic sound in the marine environment have led to a rapid growth in the number and scope of scientific studies that assess the potential physiological and behavioral impacts of anthropogenic sound on marine organisms (Richardson et al., 1995; National Research Council, 2000, 2003, 2005; Nowacek et al., 2007; Popper and Hastings, 2009). Sounds produced by anthropogenic activities such as shipping, seismic surveys, dredging, pile driving, low-frequency sonar, and wind turbines have been shown to induce stress in organisms such as marine mammals and fish, which may contribute to suppressed growth, reproduction, and immune system functioning (Romano et al., 2004; Wright et al., 2007; Rolland et al., 2012), to elicit behavioral responses (e.g., Richardson et al., 1995; Nowacek et al., 2007; Popper and Hastings, 2009), and to cause temporary and permanent threshold shifts in hearing (reviwed by Finneran, 2015). Anthropogenic sound may also mask important acoustic cues that marine species rely on for communication, navigation, foraging, or reproduction (Richardson et al., 1995; Halpern et al., 2008). Most of the research to date on effects of anthropogenic sounds on marine species has focused on marine mammals and fishes (reviewed by Nowacek et al., 2007; Slabbekoorn et al., 2010), with substantial knowledge gaps remaining in relation to the responses of marine turtles to sound (Popper et al., 2014). While marine turtles are known to detect and respond to low-frequency acoustic stimuli (i.e., 50–2,000 Hz) (Ridgway et al., 1969; O'hara and Wilcox, 1990; Bartol et al., 1999; McCauley et al., 2000; Bartol and Ketten, 2006; DeRuiter and Doukara, 2012; Martin et al., 2012; Piniak, 2012; Lavender et al., 2014; Piniak et al., 2016); such as those commonly produced by anthropogenic activities (Hildebrand, 2009), further research is needed to examine the extent that such activities may affect the behavior and physiology of marine turtles (Popper et al., 2014; Nelms et al., 2016). The few behavioral studies conducted with marine turtles in response to sound have primarily been conducted in enclosed or semi-enclosed settings, and in response to high-intensity seismic air guns, limiting the ability to assess behaviors of freely swimming turtles to specific types, levels, and frequencies of anthropogenic sound. For example, McCauley et al. (2000) exposed a green (Chelonia mydas) and a loggerhead turtle (Caretta caretta) to an approaching-departing single air gun in a cage and found that the turtles increased their swimming activity when the air gun sound levels were equivalent to 166 dB re 1 μPa, and that they demonstrated more erratic behavior at sound levels greater than 175 dB re 1 μPa, possibly indicating an agitated state. Alternatively, O'hara and Wilcox (1990) found that loggerhead turtles generally remained near or moved toward the sound source when exposed to air guns in a 300 × 45 enclosure in a 10 m deep canal, but they did not report sound levels. Finally, Moein et al. (1994) reported that repeated exposure of loggerhead turtles to air guns in an 18 m × 61 m enclosure in a 3.6 m river exhibited avoidance behavior upon the first presentation of the stimulus, but that repeated exposure did not elicit significant behavioral responses, suggesting that the turtles had habituated to the sound or had temporary shifts in hearing capabilities (sound source ranges were not reported). Physiological measurements showed increases in stress levels, and pre- and post-hearing threshold measurements showed a temporary decrease in hearing sensitivity in some turtles after seismic air gun exposures. To our knowledge the only studies conducted on free-swimming marine turtles in an open water environment were conducted by DeRuiter and Doukara (2012) and Weir (2007), whom visually tracked loggerhead turtles during seismic air gun surveys. The two studies report contrasting results with DeRuiter and Doukara (2012) documenting that loggerhead turtles dove immediately following an air gun shot (estimated received level of 191 dB re 1 μPa-peak at 130 m and 175 dB re 1 μPa-peak at 830 m), possibly eliciting a startle response, and Weir (2007) reporting that 80% of olive ridley turtles (Lepidochelys olivacea) remained at the surface during air gun activity. The differences between the two studies could be related to variations in behavioral responses by different species, variations in air gun source levels, frequencies, and/or distances, or some other unknown environmental or ecological parameter. These differences and the lack of additional studies available examining marine turtle responses to anthropogenic sound, particularly in open water environments, highlight the urgent need to develop tools and techniques that enable us to fill this important research gap. Studying the movements and behaviors of free-swimming marine animals, especially in relation to sound sources, has many logistical challenges, but the advent and use of bio-logging tools, such as radio, acoustic, or satellite-telemetry tags and data archival tags has greatly expanded the capacity to conduct such analyses. Bio-logging tools can provide insights into the behaviors and movements of marine species over long and broad temporal and spatial scales as well as at depths where these animals are not visible. Therefore, they are an increasingly popular method for examining the movements, behaviors, physiology, and/or environment of free-ranging marine megafauna, including marine turtles (Payne et al., 2014). For example, satellite tags have been used to document the broad-scale movements of marine turtles, as well as to infer their home range, migratory corridors, suitable habitats, and exposure to threats (e.g., reviewed by Godley et al., 2008). In addition, passive and active acoustic telemetry tags (e.g., Taquet et al., 2006; Lamont et al., 2015), time-depth recorders (TDRs; e.g., Eckert et al., 1989; Hill et al., 2016), and animal-borne video tags (e.g., Seminoff et al., 2006; Arthur et al., 2007) have been used to infer fine-scale movements and behaviors of animals, particularly in relation to foraging ecology and diving behavior. Bio-logging tools that combine acoustic and fine-scale movement measurements (e.g., digital acoustic recording tags, Dtags, Johnson and Tyack, 2003; Acousonde, Burgess, 2009) are a particularly useful tool for quantifying behaviors of marine organisms in response to sound; however, to our knowledge have not yet been applied with marine turtles. These tools are commonly used in behavioral response studies (BRS) and controlled exposure experiments (CEEs) of marine mammals whereby a specific stimulus [e.g., sonar, predatory acoustic cues, an acoustic deterrent device (ADD)] is played to an individual that is fitted with a tag, which measures the animal's response as well as the received sounds, thus providing a combined record of stimulus and response (e.g., Johnson et al., 2009; Tyack, 2009; Tyack et al., 2011; Southall et al., 2012; DeRuiter et al., 2013; Goldbogen et al., 2013; Stimpert et al., 2014; Harris et al., 2016; Southall et al., 2016). These tools can also be used passively to examine an animal's behavior in relation to sounds in their environment, such as sounds produced by the tagged individual (e.g., Tyson et al., 2007; Stimpert et al., 2012; Sayigh et al., 2013), calls from conspecifics (e.g., Jensen et al., 2011) or predators (e.g., Curé et al., 2013; Bowers, 2015), and anthropogenic sound sources such as noise produced by shipping and small vessels (e.g., Aguilar Soto et al., 2006; Jensen et al., 2009; Parks et al., 2011). 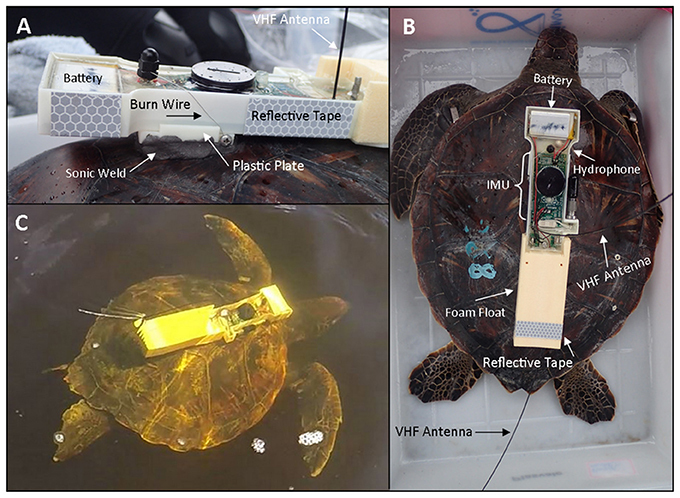 In this paper, we introduce the application of the Remora-OpenTag (ROTAG), a fine-scale digital acoustic and movement tag custom designed by Loggerhead Instruments, Inc. for use with free-ranging marine turtles. We include a description of the ROTAG and demonstrate proof-of-concept via a case study of a successful deployment on a juvenile green turtle in the Paranaguá Estuarine Complex (PEC) off Paraná state in southern Brazil. Because the habitat use of marine turtles overlaps extensively with sound produced by anthropogenic activities such as fishing, shipping, and coastal and marine development (Van Dolah and Maier, 1993; Wallace et al., 2010; Lewison et al., 2014; Fuentes et al., 2016), the application of the ROTAG will enable researchers to gain important insights regarding how and to what extent such activities may affect marine turtles. This information is critically needed and can be used to aid in marine turtle conservation and management. The ROTAG is a fine-scale digital acoustic and movement tag designed and developed by Loggerhead Instruments, Inc. specifically for use with marine turtles. The system combines an Arduino-compatible open-source inertial measurement unit (IMU) for recording high speed motion sensor data (OpenTag motion datalogger, Loggerhead Instruments Inc.) with a state-of-the-art acoustic tag for measuring sound in the marine environment (Remora-ST, Loggerhead Instruments, Inc.) and a rechargeable lithium polymer battery encapsulated with epoxy (Epotek 301) in a 3D printed ABS plastic housing pressure tolerant to 300 m depth (Figure 1). The tag is designed to sit upon an ABS plastic plate (4.45 × 4.06 cm, 0.64 in thickness) that is affixed to a turtle's carapace with epoxy (e.g., Sonic Weld). A 0.22 mm stainless steel wire is used to attach the ROTAG to this plate, and can be programmed to corrode at a specified time to release the ROTAG from the plate and the turtle. A positively buoyant syntactic foam float is attached to the anterior portion of the tag to allow for the tag to float upon release from the turtle. Two VHF radio telemetry transmitters and antennas are positioned within the ROTAG to allow for tag and turtle tracking as well as retrieval of the tag: one antenna (218–220 MHz) is positioned to transmit signals when the turtle surfaces to breath, while the other antenna (149–150 MHz) is positioned to transmit signals when the tag is floating after release. The tag is powered by three 850 mA rechargeable lithium polymer batteries, and the total power draw is ~25 mA. The dimensions of the ROTAG body and float are 25 × 5 × 2.8 cm and the in-air the tag weighs 220 g. The shape was chosen to minimize the cross-sectional area exposed to flow in order to minimize drag. Figure 1. A ROTAG deployed on a juvenile green turtle. (A) A side view of the ROTAG affixed to the turtle's carapace. A 0.22 mm stainless steel wire attaches the ROTAG to a plastic plate that is affixed to the turtle's carapace with epoxy. Reflective tape is included to assist with tag retrieval at night. (B) An overhead view of the ROTAG affixed to a turtle, indicating the main components of the tag. (C) A freely-swimming juvenile green turtle with a ROTAG. Once the burn is complete the tag will release from the plate and float to the surface. The small plastic plate will remain affixed to the turtle until it is worn off. The movement tag within the ROTAG includes a three-axis accelerometer, gyroscope, and magnetometer (sampling rate up to 100 Hz), which can be used to calculate a turtle's pitch, roll, and heading; a pressure sensor (1 Hz sampling rate) to record turtle depth; and a temperature sensor (1 Hz sampling rate) to record ambient water temperature. Data recorded by this tag is stored on a micro SD memory card that can be removed from the device and saved to a computer after a successful deployment. The acoustic tag within the ROTAG can be programed to sample sound at 24, 48, 72, 96, 144, or 288 kHz with memory capabilities of 128 GB with X3 compression. The tag can be connected to a computer via a USB cable to download acoustic files after a deployment. The hydrophone of the acoustic tag has a sensitivity of −211 dBV/μPa and can be set to have either low (21 dB gain ~190 dB re 1 μPA clip level) or high gain (33 dB gain ~178 dB re 1 μPa clip level). The ROTAG can be customized in many ways depending on the user's needs. For example, the movement tag can stream all internal sensors (accelerometer, magnetometer, and gyroscope) at 100 Hz each. However, a user can choose to only record data from a specific sensor (e.g., accelerometer) at a higher sample rate without data loss (e.g., 200 Hz). The ROTAG can also be set to record all data streams continuously or with a specified duty cycle. This includes an option to turn off the VHF transmitter at specified depths (e.g., greater than 1 m), which may be beneficial as the frequencies emitted by the VHF transmitter can be received by the acoustic tag possibly hindering acoustic measurements. In addition specific sensors could be set to turn on upon motion detection (i.e., data will be recorded for a specified duration when a defined threshold is exceeded on the accelerometer). The deployment duration of the ROTAG depends on these user-specified settings, but ranges from ~3–7 days. On 26 May 2016 we deployed a ROTAG on a juvenile green turtle during a pilot study conducted in the PEC (Figure 2). The results of the pilot study are reported elsewhere (see Tyson et al. unpublished report 2016), but data collected during this deployment are described here to showcase how ROTAGs can be used to examine marine turtle behavior and concurrent anthropogenic sound. Figure 2. 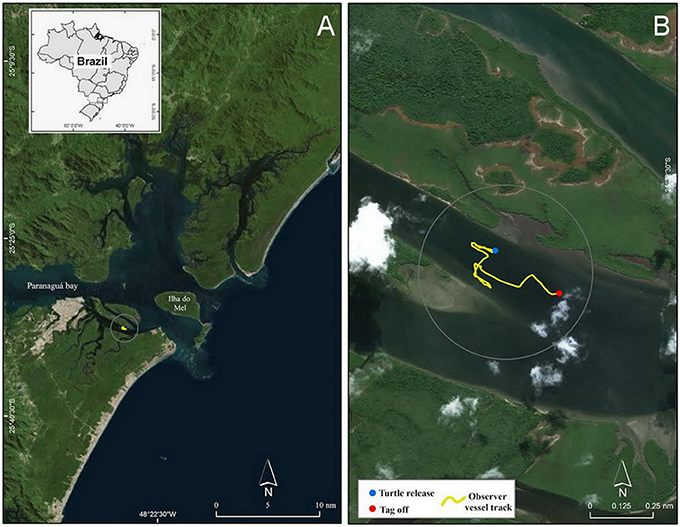 (A) Map of Paranaguá Estuarine Complex located off the northern coast of Paraná state, Brazil, and (B) an inset showing the turtle release and tag off locations as well as the observer vessel track in Canal da Cotinga. A local fisherman captured the turtle using a bottom-set gillnet on the morning of 26 May 2016. The turtle was transferred by boat to our research team ~1 h after capture. A veterinarian assessed the turtle's health (e.g., body condition, behavior, presence of fibropapilloma or other external pathologies and injuries), which was deemed to be good, and we collected standard morphometric measurements: the turtle weighed 12.28 kg and its curved carapace length was 38.50 cm and curved carapace width was 36.90 cm. Prior to tag attachment, we cleaned the anterior portion of the turtle's carapace of barnacles and other epibionts, sanded it with coarse sandpaper (e.g., 60-grit), and washed it with distilled water, 91% isopropyl, and acetone to increase bonding strength. We applied a steel-reinforced epoxy (Sonic-Weld) to the base of the plastic plate to which the ROTAG was attached and placed the plate on the 2nd vertebral scute for (Figure 1). Following SEFSC (2008) protocols, the total weight of the tag plus epoxy used for attachment was less than 5% of the turtle's body weight, minimizing the effects from increased drag and mass. Preliminary analyses by Tyson et al. (2016) using ROTAGs deployed in this manner report that respirations of a turtle before and during a deployment were statistically similar, suggesting minimal behavioral interference from the tags. We waited ~10 min for the epoxy to dry then released the turtle at 13:23:36 local time (−3 GMT) in Canal da Cotinga, an estuarine area surrounded by mangroves (Figures 1C, 2). We programmed the ROTAG to sample the accelerometer, magnetometer, and gyroscope at 100 Hz and the pressure and temperature sensors at 1 Hz. We recorded sound at 96 kHz with a low gain. We also programmed the ROTAG to turn off the VHF signal when the turtle was ≥10 m and to activate the wire attaching the ROTAG to the fixed plastic plate to start burning 250 min after the tag start time (i.e., just before dusk) to initiate tag release. During the deployment we tracked the turtle via the integrated radio telemetry tags and a VHF receiver and antenna from an observation vessel (26 foot center console vessel with two 150 Hp engines) positioned > 200 m from the perceived turtle's location. As we rarely visually spotted the turtle, these observations consisted primarily of recordings of the time points for which we heard the VHF signal, which was indicative of the turtle being at the surface to breathe. We also recorded other events of interest, such as the presence of any vessels near the perceived turtle's location (i.e., within ~2 km). As scheduled, at 16:50:00 the wire burn was initiated and at 17:04:50 the ROTAG released from the turtle and floated to the surface. Upon retrieval, we downloaded the ROTAG data onto a computer for analysis. We extracted and calibrated the movement data using custom written code in the R Statistical Program (R Core Team, 2016). We used the pressure and temperature sensor data to estimate depth and temperature, respectively (Figures 3A,B). The turtle dove 30 times during the deployment (dives were considered to be any submergence greater than 0.2 meters deep and longer than 5 s). Maximum dive depths (mean (median) ± SD) were 6.22 (6.78) ± 3.01 m, dive durations were 408.53 (256.00) ± 399.04 s, and post-dive surface durations were 22.80 (13.50) ± 23.04 s. Temperature was 21.17 (21.09) ± 0.21°C. The large decrease in temperature seen at the beginning of the deployment record and during surfacings (Figure 3B) corresponds to the ROTAG transitioning from air to water temperatures. We subsampled the accelerometer and magnetometer data to 5 Hz and used them to calculate the pitch, roll, and heading of the tagged turtle as well as the vector of the dynamic body acceleration (VeDBA), a proxy for energy expenditure (Qasem et al., 2012; Figures 3C–F, respectively). These parameters demonstrated variations in movements while the turtle was diving and minimal movement when the turtle was resting at or near the sea floor. Figure 3. 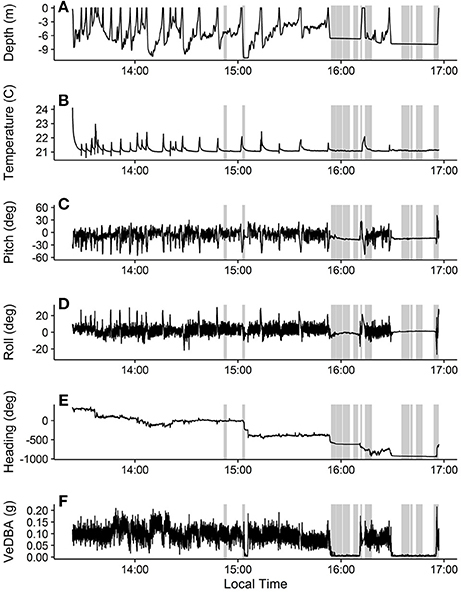 Movement and temperature data collected during the ROTAG deployment on a juvenile green turtle. Depth (A) was estimated from the pressure sensor, temperature (B) was measured by the temperature sensor, and pitch (C), roll (D), heading (E), and VeDBA (F) were estimated from the accelerometer and magnetometer data. Heading data were unwrapped to deal with issues arising from circular data (i.e., crossing 0 and 360) using the unwrap function in the signal package for R (Signal Developers, 2013; R Core Team, 2016). Gray boxes represent approximate times when vessels passing near the turtle were detected on the hydrophone. The acoustic data from the ROTAG was examined using Adobe Audition® (V1 Build 3211.2) and analyzed using the Fast Fourier Transformation (FFT) with 4,096 points FFT order, Hanning windows, and a 50% overlapping of successive windows. From this examination, we were able to pinpoint the start and end time points of all instances when vessels passed closely by the turtle (estimated distance is <2 km given the location of the observation vessel and surrounding land masses) (Figure 3). During many of these instances, the turtle appears to remain still on or near the sea floor. Figure 4 showcases the movements of the turtle and the corresponding spectrogram of sounds for the dive that occurred from 15:52:36 to 16:12:24. While there is no clear behavioral response between individual boat passes and turtle behavior (despite the slight change in pitch, roll, heading at VeDBA at ~15:56:33), this schematic showcases how useful the information recorded on these tags can be in examining turtle behaviors in response to anthropogenic sound. 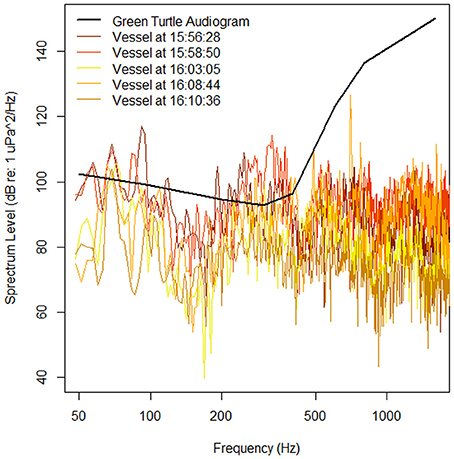 Spectrum levels of the vessels (Figure 4) were measured and compared to an average audiogram of a green turtle in Figure 5. Figure 4. Depth, pitch, roll, heading, and VeDBA of the juvenile green turtle during a dive with multiple vessel passes overlaid onto the simultaneous acoustic record (i.e., spectrogram). The vessel passes are the broadband signals with varying amplitudes and durations found at ~15:56:28, 15:58:50, 16:03:05, 16:08:44, and 16:10:36. VHF transmitter signals picked up by the audio board are apparent as regularly spaced broadband clicks of consistent sound pressure levels. Spectrograms were created in R using the spectro function in the seewave package for R (Sueur et al., 2008; R Core Team, 2016) with 4,096 points FFT order, Hanning windows, and a 50% overlapping of successive windows. Figure 5. Audiogram of a juvenile green sea turtle (adapted from Piniak et al., 2016 and measured in dB re 1 uPa) and spectrum levels of vessels that passed within ~2 km of the tagged turtle (true distances between vessel and turtle are unknown) between 15:52:36 and 16:12:24 (Figure 4). Spectrum levels were measured at the times when the vessels were estimated to be at their closest approach of the turtle. Spectra for noise level measurements were calculated by isolating 32,768 points in between the VHF pings. A Hanning window was applied to each segment and a FFT calculated (frequency resolution = 2.93 Hz) using MATLAB. Spectrum level was calculated by adjusting for the hydrophone sensitivity, gain, Hanning window (+6 dB), and subtracting 10(log(frequency resolution)). Ten sequential spectra were averaged to calculate an average spectrum level that covered about 5 s of recording time from the original recording (Figure 5). While these vessels produce generally broadband signals (Figure 4), the turtle may have detected their presence as the spectrum levels of all vessels were above their hearing thresholds, specifically in the 200–400 Hz range. Even if detected; however, the turtle may not have responded because the measured spectrum levels were much lower than those previously shown to illicit behavioral responses in turtles (Figure 5; e.g., ≥166 dB re 1 μPa, McCauley et al., 2000). In addition, during the 221 min of the deployment, 13 vessels passed closely by the turtle. Therefore, it is likely that this turtle is either habituated to the sounds produced by these vessels or that they have experienced some level of hearing loss due to their constant presence. More records of vessels near tagged turtles, their approximate distances, and estimates of their spectrum levels are needed to determine if turtles, such as the one presented here, responded to the sounds produced by vessels such as this and if so what this response may be (e.g., remain still on sea floor, surface, swim away). Marine turtle populations have experienced severe declines globally due to direct harvest, incidental capture in fisheries, and the destruction of foraging and nesting habitats (Lutcavage et al., 1996; Wallace et al., 2011a,b). Because the habitat use of marine turtles overlaps extensively with anthropogenic activities that produce sounds such as fishing, shipping, and coastal and marine development (Van Dolah and Maier, 1993; Wallace et al., 2010; Lewison et al., 2014; Fuentes et al., 2016) it is important to develop tools and techniques that enable us to examine how such activities affect the behavior and physiology of these threatened species. The case study presented here showcasing a successful deployment of a ROTAG on a juvenile green turtle provides proof of concept for using these tags to examine marine turtles in response to sound and demonstrates their utility in examining the general soundscapes of marine turtles. These advancements will increase our understanding of the acoustic threats marine turtles face and can be used to aid in their successful conservation and management. Marine species such as fish and marine mammals have been observed to respond to anthropogenic sounds produced at construction and demolition sites (e.g., Popper and Hastings, 2009; Buckstaff et al., 2013), by vessels (e.g., Aguilar Soto et al., 2006; Lemon et al., 2006; Jensen et al., 2009; Parks et al., 2011), and from low-frequency sonar (DeRuiter et al., 2013; Goldbogen et al., 2013). At this time, it is unknown whether free-ranging marine turtles respond to such sounds and to what extent their responses may be if present. Given that the sounds produced by many of these activities dominate the frequencies within the range of best hearing for marine turtles (50–500 Hz; Hildebrand, 2009) turtles are particularly susceptible to their presence. The ability to tag a turtle with a tool such as a ROTAG would enable researchers to examine if turtles respond to these types of anthropogenic activities, and if so the type and potential fitness consequences of these responses. For example, Goldbogen et al. (2013) and DeRuiter et al. 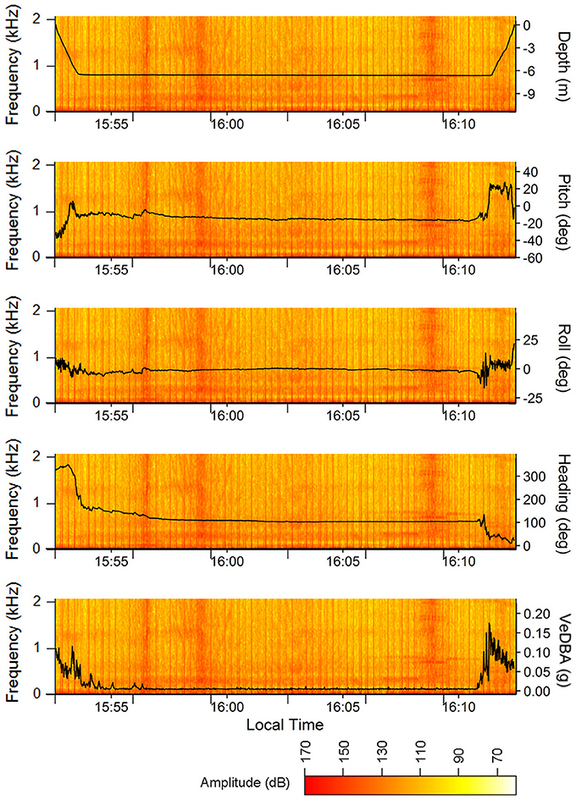 (2013) used DTAGs, a bio-logging tool from which the ROTAG is based, to examine whether blue whales (Balaenoptera musculus) or Cuvier's beaked whales (Ziphius cavirostris) responded to mid-frequency (1–10 kHz) active (MFA) sonar. Both species exhibited responses to the MFA sonar: blue whales ceased deep activities, increased their swimming speed, and directed travel away from the sound source (Goldbogen et al., 2013). Cuvier's beaked whales (Ziphius cavirostris) responded by ceasing normal fluking and echolocation, and swimming rapidly and silently away from the sound source extending both their dive duration and subsequent non-foraging interval (DeRuiter et al., 2013). Similar insights in behavioral responses of marine turtles to sound can be obtained from the tags presented here (e.g., significant changes in parameters such as dive depth, heading, VeDBA, or dive duration) and could be used to help managers and policymakers to develop appropriate mitigation strategies, enact restrictions or legislation to limit such activities, and guide monitoring programs in regions where marine turtles may be present and vulnerable. Sound has also been used to warn or repel animals from dangerous areas or activities. For example, one such anthropogenic activity of particular concern to marine turtles is dredging to sustain the demand for sediment (e.g., for beach nourishment projects), and maritime development (e.g., ports) to maintain shipping channels (Dickerson et al., 2004; Sundin, 2007; Goldberg et al., 2015). Dredging is often conducted with hopper dredges, which remove sediment through suction (Banks and Alexander, 1994; Goldberg et al., 2015). The hopper dredge dragheads are slow-moving and nearly silent and can cause physical harm (e.g., injuries, fractures, and hemorrhage) and mortality to marine turtles and impacts to their habitat (Dickerson et al., 1991, 2004; Banks and Alexander, 1994; Goldberg et al., 2015). Strategies to mitigate impacts of dredging on marine turtles and their habitat include: relocating marine turtles away from dredging sites (Dickerson et al., 2007; Sundin, 2007), modifications to hopper dredges drag heads (Banks and Alexander, 1994), and temporal restrictions to reduce the likelihood of turtle and hopper dredger interactions (Dickerson et al., 2004). Another potential strategy for minimizing interactions of marine turtles with anthropogenic activities, including dredging, is to warn or repel marine turtles from areas where potentially harmful activities are or will take place. Given that marine turtles can detect and respond to low-frequency acoustic stimuli, acoustic harassment devices (AHDs) and acoustic deterrent devices (ADDs) could be used as a strategy to successfully repel marine turtles from various threats, including from areas that are being dredged or potentially high interaction fishing areas (Van Der Meij et al., 2015). The ROTAG could be used to test and determine the effectiveness of various ADDs or AHDs providing insights into further development of these devices and their suitability as mitigation strategies to protect marine turtles. While little evidence exists that sea turtles use sound for communication, sea turtles may use sound for navigation, locating prey, predator avoidance and environmental awareness (Piniak et al., 2016). It is likely that they, like other vertebrates, use ambient soundscapes to create an auditory scene that can provide them with critical information about their environment and their position (Bregman, 1990; Slabbekoorn and Bouton, 2008). For instance, the sound of waves crashing on a beach could indicate that they were close to shore, or near an appropriate nesting beach. The sounds of chorusing fish or snapping shrimp could provide a signpost that they were near an appropriate foraging area like an estuary or coral reef. Anthropogenic sounds have the potential to mask some of these important soundscape auditory cues. The biological significance of sound for marine turtles is not well understood, and the use of a ROTAG to describe the overall soundscape of turtles could provide interesting and important information regarding their ecology and biology that to date have been hard to obtain. The case study presented here provides proof of concept that ROTAGS can successfully be applied to free-ranging marine turtles. The information available from these tools can be used in a variety of ways for marine turtle conservation and ecology in particular to determine the response of marine turtles to anthropogenic sound. While these tags are useful for many applications, several limitations still exist at this time. Being high-resolution recording tags, ROTAGs can only be deployed on turtles for a short period of time (i.e., ~3–7 days depending on user settings). However, the richness and breadth of the data collected by ROTAGs cannot currently be obtained with longer-term bio-logging tags, such as satellite tags or other time-depth recorders, and therefore can be used to enhance our understanding of fine-scale marine turtle behavior, specifically in relation to sound. Another limitation common to all capture/release and tagging studies, the possibility of inducing a capture and/or tagging response by the animal under study, is something that needs to be considered. For example, Thomson and Heithaus (2014) and Hazel et al. (2009) found that some green turtles fitted with animal borne video cameras and TDRs, respectively, were influenced by capture stress for several hours (0–6) after release. In contrast Seminoff et al. (2006) reported that turtles tagged with a CrittercamTM resumed normal activities within minutes of being released. The ROTAG will create drag for the turtle, which may result in modified swimming behaviors. For example, van der Hoop et al. (2014) found that bottlenose dolphins carrying DTAGs swam more slowly than dolphins without DTAGs possibly in an effort to reduce the metabolic cost of drag created from the tags. Drag may also be induced by the plastic plate left affixed to the turtle after the ROTAG is released (Jones et al., 2013), but given the low profile of the plate we anticipate this drag to be minimal. More deployments are needed to further investigate whether a capture or tagging response is elicited with ROTAGS and if so how they can be minimized. Finally, the presence of flow noise recorded by the tags, which increases with decreasing frequency (Burgess et al., 1998; Merchant et al., 2015), may mask sounds of interest within the range of marine turtles best hearing (i.e., <2,000 Hz). In the case study presented here; however, flow noise was typically at frequencies less than 70 Hz (e.g., Figure 4) and therefore was minimal. Given the threatened status of many species and populations of marine turtle, mitigation measures are needed, and often required by laws and regulations, to reduce marine turtle injuries and mortalities associated with these activities (Wallace et al., 2013; Fuentes et al., 2015). Until the threat of anthropogenic sound on marine turtles can be assessed, such mitigation measures may be unproductive in conserving these species. The application of the ROTAG or similar acoustic-movement tags will enable researchers to start addressing this potential threat and to determine in what ways and to what extent anthropogenic sound may impact marine turtles. This information can then be used to more appropriately guide laws and regulations devised for conserving these threatened species. In addition, the broad range of applications the ROTAG presents make it a unique tool for expanding our understanding of the fine-scale movements and behaviors of marine turtles, which may provide new insights into their ecology, such as their foraging behavior, physiology, and predator response. RT, WP, CD, DN, and MF contributed to the acquisition, analysis, and interpretation of the data as well as by drafting and revising the manuscript. DM and MH designed and built the RO-TAG used in this study and contributed to the analysis and interpretation of the data, as well as by revising intellectual content. This research was funded by Van Oord. We wish to thank Van Oord (www.VanOord.com) for funding this research, specifically Heidi van der meij and Remment ter Hoftede for their help in project execution. We also with to thank the Ecology and Conservation Laboratory of the Federal University of Paraná, Brasil, and the MarBrasil Association (www.marbrasil.org) for their support during the field operations of this research. Thanks also go to Jerry Moxly, Gabriela M. Vélez Rubio, Daniel Gonzalez, Ignacio Matias-Bruno, Beatriz Neves, and Robin Hilbert Loose for their help in the field. All scientific activities were conducted under the Brazilian Scientific Permit from the Ministry of the Environment (SISBIO—43443-3) and the Florida State University Animal Care and Use permit FSU/ACUC #1609. Banks, G. E., and Alexander, M. P. (1994). Development and Evaluation of a Sea Turtle Deflecting Hopper Dredge Draghead. Washington, DC: U.S. Army Corps of Engineers. Bartol, S. M., and Ketten, D. R. (2006). “Turtle and tuna hearing,” in Sea Turtle and Pelagic Fish Sensory Biology: Developing Techniques to Reduce Sea Turtle Bycatch in Longline Fisheries, eds Y. Swimmer and R. Brill (Honolulu, HI: NOAA (Natl Ocean Atmos Adm) Tech Mem NMFS-PIFSC-7), 98–105. Bowers, M. (2015). Behavioral Ecology of the Western Atlantic Short-finned Pilot Whale (Globicephala macrorhynchus). Ph.D., Duke University. Bregman, A. S. (1990). Auditory Scene Analysis: The Perceptual Organization of Sound. Cambridge, MA: MIT Press. Dickerson, D., Richardson, J. I., Ferris, J. S., Bass, A. L., and Wolf, M. (1991). Entrainment of sea turtles by hopper dredges in Cape Canaveral and King's Bay Ship Channels. Environ. Effect. Dredging 91, 1–9. Goldberg, D. W., Almeida, T., Tognin, F., Lopez, G. G., Pizetta, G. T., Junior, N. O., et al. (2015). Hopper dredging impacts on sea turtles on the Northern Coast of Rio de Janeiro State, Brazil. Mar. Turtle Newsl. 147, 16–20. Harris, C. M., Thomas, L., Sadykova, D., DeRuiter, S. L., Tyack, P. L., et al. (2016). “The challenges of analyzing behavioral response study data: an overview of the MOCHA (multi-study ocean acoustics human effects analysis) project,” in The Effects of Noise on Aquatic Life II, eds A. N. Popper and A. Hawkins (New York, NY: Springer), 399–407. Lutcavage, M. E., Plotkin, P., Witherington, B., and Lutz, P. (1996). “Human impacts on sea turtle survival,” in The Biology of Sea Turtles, eds P. Lutz and J. Musick (Boca Raton, FL: CRC Press), 387–409. McCauley, R. D., Fewtrell, J., Duncan, A. J., Jenner, C., Jenner, M.-N., Penrose, J. D., et al. (2000). Marine seismic surveys – a study of environmental implications. APPEA J. 40, 8. Moein, S., Musick, J., Keinath, J., Barnard, D., Lenhardt, M., and George, R. (1994). Evaluation of seismic sources for repelling sea turtles from hopper dredges. Final Report submitted to the US Army Corps of Engineers, Waterways Experiment Station. Virginia Institute of Marine Science (VIMS), College of William and Mary, Gloucester Point, Virginia, 42p. National Research Council (2000). Marine Mammals and Low-Frequency Sound: Progress Since 1994. Washington, DC: National Academies Press. National Research Council (2003). Ocean Noise and Marine Mammals. Washington, DC: National Academies Press. National Research Council (2005). Marine Mammal Populations and Ocean Noise: Determining When Noise Causes Biologically Significant Effects. Washington, DC: National Academies Press. Piniak, W. E. D. (2012). Acoustic Ecology of Sea Turtles: Implications for Conservation. Ph.D., Duke University. Popper, A., Hawkins, A., Fay, R., Mann, D., Bartol, S., Carlson, T., et al. (2014). Sound exposure guidelines for fishes and sea turtles: a technical report prepared by ANSI-accredited standards committee S3/SC1 and registered with ANSI. ASA S3/SC1 4. Richardson, W. J., Greene, C. R. Jr., Malme, C. I., and Thomson, D. H. (1995). Marine Mammals and Noise. San Diego, CA: Academic Press. SEFSC, N. (2008). Sea turtle research techniques manual. NOAA Technical Memorandum NMFS-SEFSC 579. Sundin, G. W. (2007). Reducing Impacts of Hopper Dredging on Marine Turtles in the Northwestern Gulf of Mexico. Masters of Sciences. Tyson, R. B., Piniak, W. E. D., Domit, C., Nowacek, D. P., and Fuentes, M. P. B. (2016). Behavioural response of juvenile green sea turtles (Chelonia mydas) to the FaunaGuard Turtle Module. Final Report submitted to Van Oord (www.VanOord.com). Rotterdam, The Netherlands, 41p. Van Der Meij, H., Kastelein, R., Van Eekelen, E., and Van Koningsveld, M. (2015). FaunaGuard: a scientific method for deterring marine fauna. Terra et Aqua 138, 17–24. Van Dolah, R. F., and Maier, P. P. (1993). The Distribution of Loggerhead Turtles (Caretta caretta) in the Entrance Channel of Charleston Harbor, South Carolina, U.S.A. J. Coast. Res. 9, 1004–1012. Weir, C. R. (2007). Observations of marine turtles in relation to seismic airgun sound off Angola. Mar. Turtle Newsl. 116, 17–20. Wright, A. J., Soto, N. A., Baldwin, A. L., Bateson, M., Beale, C. M., Clark, C., et al. (2007). Do Marine mammals experience stress related to anthropogenic noise? Int. J. Comp. Psychol. 20, 274–316. Copyright © 2017 Tyson, Piniak, Domit, Mann, Hall, Nowacek and Fuentes. This is an open-access article distributed under the terms of the Creative Commons Attribution License (CC BY). The use, distribution or reproduction in other forums is permitted, provided the original author(s) or licensor are credited and that the original publication in this journal is cited, in accordance with accepted academic practice. No use, distribution or reproduction is permitted which does not comply with these terms.